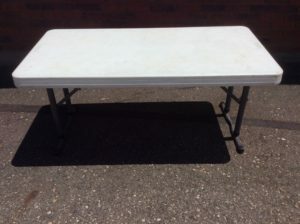 It’s summertime; you’re planning an outdoor event, and you need tables. What type of table do you need? Do you prefer square or rectangular? 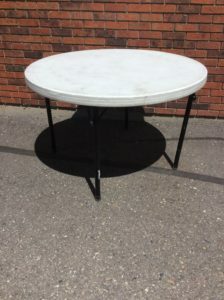 Do you need a bistro table, more commonly known as a cocktail table? 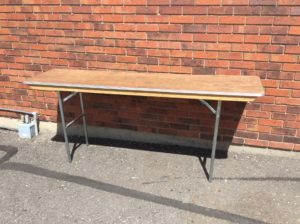 Does it need to be 8’ long or do you need a smaller table? Do you have space constraints? How many people will need to be seated? Do you have an area large enough for the event you’re planning? Banquet table refers to a rectangular table. 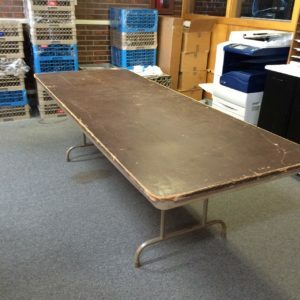 We stock 8’, 6’, 5’ and 4’ banquet tables. A standard 8’ banquet table is 96” long, 30” wide and 30” tall. A standard 6’ table is 72” long, 30” wide and 30” tall. Five-foot banquets are 60” long, 27” wide and 30” tall. Four-foot banquets are slightly smaller, at 48” long, 24” wide and 30” tall. An 8’ banquet table will seat 8 people comfortably and 10 in a pinch if people don’t mind sitting on the ends. A 6’ banquet will seat 6 and 5’ and 4’ banquets seat 4 people. Our standard round tables are 60” in diameter and 30” high. A standard 5’ round will seat 8 people. We also have 48” round tables, albeit in limited quantities. 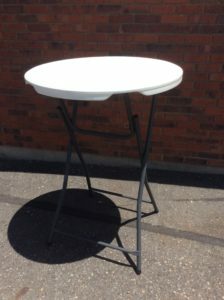 Bistro or cocktail tables are ideal for cocktail parties or social gatherings where seating either isn’t available or is limited. They allow people to mingle and use the table as a temporary place to stand and eat. Bistro’s are 32” across and 43.62” tall. We also stock and rent 5’ and 6’ half round tables. Which like the name implies, they are half circle. Half tables are great for tight areas or for positioning against a wall. Conference tables are 6’ rectangles which are 18” wide. They could be used for putting cakes or deserts on them, displaying photographs or trophies or as a sign in table for a conference or wedding. 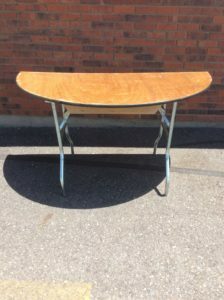 We rent 8’ wooden tables for yard sales at discounted rates. We have both 36” wide and 30” wide wooden tables. Wooden tables are ideal for yard sales as they hold a lot of merchandise and stand up to heavier items. No matter what type of table you need, chances are we have it in stock at Grand Events. Give us a call and we’ll help you choose which one is right for your event.